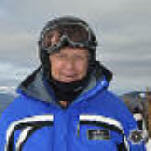 This author's ski-teaching career has primarily involved coaching adults. He is not a child psychologist, only a parent, grandparent, and observer of children. He has taught young children to ski, and watched his own son learn when the boy was one year old (he was almost two). The reality is that very young children (say, under 6) are best taught by instructors who have specialized in that area. There are five phases before a child can ski successfully: 1) Learning to deal with cold and white landscapes, ski slope machines, and people moving about, so that focus on skiing can be attained, 2) Tensing the legs so they support (getting over the "rubber legs" stage), 3) tipping the legs and therefore the skis so the skis' edges engage the snow, 4) twisting the legs so the skis point a new direction, 5) moving the legs apart and together. (Actually, these are about the same phases adults must go through to learn to ski.) Getting children through these stages is a frustration to parents, and probably even more frustrating to the kids. But then, watch out! Once past these stages, your child may want to ski rather than go to school. That was the case with my son. Introduction: Kids come in different sizes and shapes, different genders, and different ages. Generalities about them are only that; we must consider each individual as well. Kids also come from different home environments which will cause them to respond to new environments (such as skiing) in their own ways, and these responses may even be more varied than that of adults, for the kids' experience zone is mostly narrower than that of adults. Kids have not dealt with as many social or environmental variables yet, and so new situations may be stressful, and they may make wrong choices about how best to cope. For some, an early ski school experience is also leaving Mommy and/or Daddy for about the first time. And some have never seen snow, let alone have had long boards clamped to their feet, nor been asked to slide on them down a slippery hill or walk up it. Some have not done athletic things. Kids also tend to live in a fantasy world, foisted on them in part by adults, who espouse things like Santa Claus, humanized animals, people who fly, ghosts, fairies, and the like. A lad came to an adult once, and asked, wide-eyed and serious, "Can you slay dragons?" But doing things on skis is not about fantasy, it is about doing things, and the transition for a child toward reality may come haltingly. Anatomy and Physical Development issues. Children are born with heads that are proportionally larger than that of adults, but as the kids grow that difference diminishes. Thus, the child is a bit more top-heavy than an adult, creating more of a balance issue especially for the littler ones. Too, when children move their heads this way or that, they create a proportionally greater force than would adults, creating more force on the skis, too. Young children have not only not developed full muscle mass, but they have not developed the finer motor skills to fire those muscles in accurate and sophisticated ways. Neither have they yet developed the coordination skills they will eventually use to work several muscles at a time and in varying degrees. The simple skill of tilting a foot to the side so the ski edge can grip can be quite elusive for a child (and a few adults, too), even when coached. Anyone who has taught a few children to ski has likely experienced the "rubber legs" phenomenon in which the child lets the legs go limp rather than using them for support; usually this tactic passes soon but not always, and is probably an index of how ready a child is to ski. How children learn skiing. Children can understand concepts. They certainly understand that when they slide downhill they have lost the attachment to earth they have been used to, creating glee in some and fear in others. But concepts must be expressed simply and in terms familiar to them. Thus the snowplow or braking wedge is called the pizza (after a wedge-shaped piece of the pie) and the parallel position is called french- fries (after linearly sliced potatoes) or railroad tracks. They respond to the call "Red light!" by making the stopping pizza shape with their legs and to "Green light!" by making the going french-fries shape. Because kids mimic adults, demonstrations can work well. For instance, children can tip their legs to the side just by watching an adult do it, and then understand while sliding and doing that move how it alone can turn them; they don't need to understand why the move turns them, and may not be able to. They learn by doing more than they learn by thinking about what is happening; it is a trial and error experience, like much of their childhood play. It is therefore up to the teacher to perform maneuvers for them to copy that will get them to experience the skiing positions that will work for them; once felt and repeated, these maneuvers will become part of their muscle memories and will be applied instinctively when and where needed. Apparatus. Devices are available to get kids through some of the early learning stages. If the french-fries or pizza position is hard for them, there are stretch straps with clamps, called "edgy-wedgies" that attach to the two ski tips and hold them closer together. These can interfere with the walking move, however, and should not be used for long and probably removed once down the slope, to be reattached next time starting down. There are little post devices like a T-bar the child can straddle while being pulled uphill or held back going downhill. Tethers provide a way to control a child's first descents, or one parent can release a child on a gentle slope and the other parent catch that child at the bottom. While these devices help the child learn the sliding sensation, used improperly or for too long ,they can also teach ineffective stances, for they alter the normal skiing forces. Most children learn to ski without such props anyway. "Leashes and harnesses aren't bad...as long as your kids don't rely on them for support or balance" Keep the lines slack, so your child learns to balance and steer him[or her]self. The leash is a safety device: Only tighten the reins to prevent a runaway tot. And, Murphy advises, never use the leash as an excuse to take kids on trails they are not ready for: "Over-terraining kids is the worst developmental sin out there because kids develop defensive habits" [emphasis added]. If you prefer to teach your kids rather than put them in ski school, let them progress at their pace, not yours. classic "wedge-lock" in circa 5-year old skier--is it necessary? (See photos below of same-age skiers). How children ski. Above we talked about how children--especially younger ones--have less muscle mass and therefore less leg strength and also that their motor skills are not as fine-tuned as these skills will be when children are older. And also how their heads are proportionally large. This affects how they ski. Often you will see them riding in the pizza position with their legs held stiffly while leaning back. Sometimes they bend at the waist, bringing their heads forward to counterbalance their backward lean. Such a position seems to them to give maximum effect from their bodies, as the straight-legged position lets the bones hold more of the forces. But in this locked position, the muscles are always stressed and not available to finesse adjustments to pressuring, tilting, and twisting movements. It is not as efficient a way to ski as the parallel french-fry position of the skis. This author's opinion is that the "wedge-lock" stance comes not only from factors of anatomy but at least as much from the students having been advanced too rapidly to terrain that is too steep for their skill level. (This often happens with adults, too.) Instructors and ski schools are pressured by many parents and even by the kids ("Aw, when are we going to get to ski a black diamond?") to leave the practice slopes before they have the skills for the next slope up, and so the known skill--the pizza position--is what is instinctively used. Once on the steeper slope, they are not able or willing to abandon the security of the pizza to try something untested and certainly they will not now want to go back to the practice slope as if being demoted. However, this author has seen children in race courses skiing carved parallel turns while their peers of the same age are out on the slopes in locked wedges. See, for instance, the photos on the Sugar Bowl ski team's website: exits. He has watched his own grandson ski parallel at five years and tip his skis while doing so. 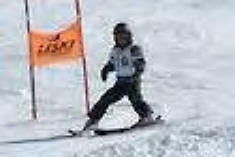 He has had expressed to him opinions by national-level demonstration team skiers and ski-team race coaches, who have taught their own children the parallel turn early, that support his belief. 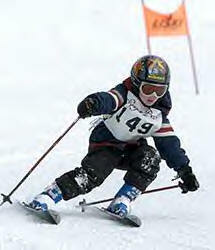 A young child has a lifetime of skiing opportunity ahead; it is O.K. to take a bit of extra time to get them off to the best start; in fact, that is our responsibility as their mentors. But we must still deal with their impatience, as "wait" and "later" will not be readily accepted, and so we must be imaginative in our coaching so that it involves fun play and games directed to learning specific skills, movement patterns, and positions. Rewards in the form of badges or patches, with extra privileges (including a reward to advance to new terrain when a particular skill is demonstrated--but not before--or skiing among trees or over a bump with a little jump), can encourage real successes. One parent got success by offering a dime for every parallel turn! Teaching children to ski, then, is a significant challenge. It might be as great a challenge--or more--to teach their parents to accept lesser early goals for their children so these parents will encourage their children to learn basics first. tipping both skis same way (grass skirt optional). 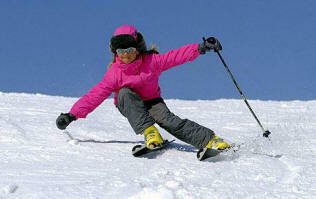 When to start children skiing. There is a common belief--or misbelief--among many adults (especially mamas and proud papas) that children can learn skiing remarkably faster than adults. And so the logic follows that a child should be started at a very early age. (And I did this with my own son at just under age two, but his mother was a ski instructor and we lived in the mountains, so he had a familiar environment; he was emotionally crushed when he finally had to go to Kindergarten and could not ski all day, every day. He's only now getting over that, although now over 50 years old!). Some children do learn faster than adults, but these kids are the winners. They are the ones who have managed to accept the skiing environment, perhaps having been coached into better than some who were rushed, and are more willing to take risks and try new things. They are the ones we see on the slopes. Some others are back in the ski school's "Sick and Sad" room, not having their best day. Adults will see the kids skiing along well, and in many cases better than the adult who is watching. But what that adult does not know is how many days the kids have already been skiing, and skiing with instruction, too, for it is more likely that a child will have spent more time in ski school than an adult will have. There is clearly a moral here for these watching adults! If you do put your child in ski school, heed the advice the school will give you and make a disappearing act. Many children will prefer to maintain the bond with you so long as you are on the scene, but if you are not, it is remarkable how soon and how well most will bond with their instructor. If this did not happen it would obviously be impossible to have children's ski schools, for the instructors would spend their whole time playing mother hen rounding up the kids and accomplishing nothing else if that. Some ski schools will give out pagers so they can contact you, or will get your cell phone number in case of a need to call you. There may be message boards posted at lift tops, too, to alert folks of a need to check back. If your child has a medical condition that needs to be communicated to the ski school or instructor, ensure that you do so, but don't expect the instructor to monitor your child for medications, shots, or the like. Also, if the child has a disability of some type, be candid about that, too, so the school can attempt to assign an instructor who knows how to teach for that condition and give you and your child--and the others in the group as well--the greatest chance of a successful session. Kids' gear: poles, helmets, skis, bindings, gloves, goggles, etc. Today there is fine ski gear made especially for children. Just as with adults, the skis should be soft enough that the child's weight can cause them to bend when the skis are tipped on their sides. The length should be shorter than the child, no more than up to chest height or even shorter. Boots should be bendable by the child in the forward direction, not to the side. The boots are usually made to accept only one pair of light or medium weight socks, and long underwear and pants should not be tucked inside. Bindings should be set by a certified shop to release at the appropriate pressure. Ski poles may be carried, and are useful in walking, but ski schools often prefer to omit them, for children may be careless about where the tips go, an especial problem in a group of eager kids. Without poles, the children are more likely to find their ski edges sooner, for they just slip back and forth in place when attempting to walk until they finally learn to tip the skis a bit onto their sides. This can frustrate them, however, so adults need to be ready to give a little pull or push until the kids happen to get things in the right position for success. Helmets are now commonly used by children and some adults believe such headgear probably prevents some injuries, but data is only now being accumulated to show how effective helmets are--or are not. Adults are wearing helmets more now, too, and some parents feel they should do so to set an example for their children. Adults lose gloves and goggles, and kids lose them even more. Straps and attachments so these items stay in place may help this problem, but expect it to occur and have spares available; likely it is cheaper to have them with you than to replace them at the resort. Test the gloves to be sure they can be put on again readily even if a bit wet; some seem impossible to put on again, and expect the child to take these unfamiliar items off. Curiously, when their hands get cold, children often remove their hands from gloves, apparently thinking the glove is making their hands cold. Goggles, too, may seem like a nuisance to a child and get removed even though needed if cold. Sunblock is needed. Sunglasses can be a must. And, kids can get cold suddenly and be totally preoccupied with the unfamiliar pain even though it may not be a real problem, so be ready to somehow warm them up even before you can get inside; have spare headgear, mittens, etc. handy on cold days or if desperate even wrap your body around the child (but take care how you do this and explain the purpose so no one, including the ch ild, misinterprets this protective action). Survival issues for children. Children have not yet experienced or heard of many of the things that can go wrong on a ski slope. And if they have, they may not care; thus to reduce their risks, they must be watched over. For instance, being short, they are harder for others to see, especially if on the down side of a bump or swale. Coach kids to avoid such places. Too, they can make turns almost on that literal dime, and may scoot unknowingly right into the path of an equally unknowing adult behind them. On narrow trails of high traffic, you could ski behind children, perhaps even with your arms and poles out to the sides to give others warning, anticipating your charge's direction changes. Traffic may be higher at certain times of day, and you might avoid such times with kids. Things like sunblock and dark glasses may seem irrelevant to them and they may not want their goggles or gloves anywhere in their vicinity--even after they get cold. Make sure, though, they have adequate protection against cold and sun with them, for instance, should the chair lift stop and they be stranded a long time in the chill air. Also train them on what to do if that happens, and of course coach them in riding chair and other lifts. And you know the bathroom drill--attempt bathroom stops before going out on the snow or know where the slopeside restrooms are; cold weather can create urgencies. Many kids will want to ski in the trees, for it is a thrill to have the trunks whiz past, but trees are a lot harder--and may have stubs protruding--than soft little bodies should an error occur. Helmets may help prevent some injuries in such cases. Jumping should be similarly monitored, discouraged until they are ready but then included as part of the skiing experience for the action teaches leg flexing and extending as well as rebalancing. This list, as in all safety issues, is a partial list. A word on children's ski instructors and children's ski schools. Alpine skiing is not anything anyone has to do anymore. We no longer travel on skis much, and if we do we use cross-country skis that give us a more natural walking motion. Mainly now we use skis to have fun. So do kids. They, especially, learn through play, and the more fun the play is the longer they will stay at it and the more they will learn. Kids' ski instructors must therefore know something about having fun and also know something--a lot--about kids' culture so they can relate to what kids today think of as fun. And so it often follows that kids' ski instructors are not too far past being kids themselves, or are young moms who know what kids like. But there are mature and older adults, too, who have the knack of relating to kids' ways of learning. Some professional child psychologists have found great interest working with (playing with) children who are learning to ski. 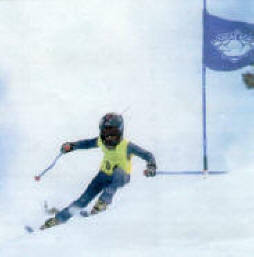 Most ski schools expect their staffs to be able and willing to teach both children and adults, but most also organize their staff into separate children's and adult's divisions (curiously, many adults think that ski schools are only for children, but in fact adults take lessons in about the same numbers as children). The Professional Ski Instructors of America offers clinics to instructors leading to certification to teach children, and such training and certification can be an index to help locate an instructor who is more adept at teaching children. Too, ski magazines annually rank America's favorite ski resorts as determined through reader polls, and often a factor that is reported is satisfaction with children's and adult's ski schools. Teaching children does require a lot of energy, animation, and vigilance to ensure all stay near the instructor and do not take excessive risks, and appropriate discipline can be necessary for both class handling and safety. Because teaching children emphasizes social skills, however, and children's instructors are hired with such selection in mind, children's instructors may have less training in and experience understanding and teaching technical skills than will instructors of adults. And so, as in all matters of raising children, important choices must be made by parents among the factors of fun, love, tough love, skill enhancement, safety, personality, individuality, and much more. Kids can ski! Skis are parallel and tilted same, at end of turn the uphill (right) ski is ahead, arms are wide and forward with hands and poles out from body, shoulders are hunched forward, body is balanced over both feet (adjusted for forces of turn), upper body is countered to lower body (skis point toward side of hill, belly button points downhill), legs are angulated (bent) a bit at waist and a lot at knees, and best of all--a great smile. --from Technical Skills for Alpine Skiing, by Ellen Post Foster. Watch a 5-year old racer on YouTube: exits. CHILDREN'S INSTRUCTION HANDBOOK, by Professional Ski Instructors of America: Lakewood, CO, 2000. GLEE, by Alan Bertrand. Atelier Esope Chamonix. 2005. The Panda method of teaching at Chamonix, France. KIDS ON SKIS: A Guide to Family Skiing and Children's Instruction, Equipment, and Clothing, by I. William Berry. Charles Scribner's Sons: New York, 1980. PSIA CHILDREN'S INSTRUCTION MANUAL. Professional Ski Instructors of America: Lakewood, CO, 1997. 151 pages. CHILDREN/'S SKI AND SNOWBOARD MOVEMENT GUIDE. Professional Ski Instructors of America: Lakewood, CO, 2005. 28 pages. CHILDREN/'S INSTRUCTION HANDBOOK: Alpine Skiing and Snowboarding. Professional Ski Instructors of America: Lakewood, CO, 2000. 84 pages. 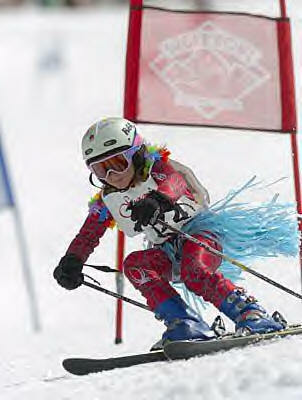 PSIA ALPINE ENTRY-LEVEL GUIDE FOR CHILDREN'S INSTRUCTORS. Professional Ski Instructors of America: Lakewood, CO, 1997. 33 pages. CAPTAIN ZEMBO'S SKI & SN0WBOARDING GUIDE FOR KIDS. by John Alderson. 1996. CHILDREN'S ALPINE TEACHING. Vail/Beaver Creek Ski Schools: Vail, Colorado. Ages 3 to 15 years. 200 pages. 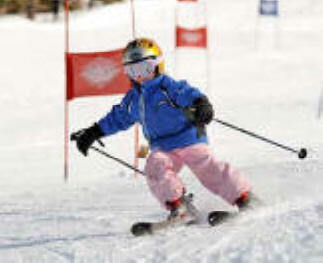 KID-SKI: How to Teach Your Child to Ski--A Methodology Ages 1-8. Apple Rise Sports. Written for adults who are high intermediate or better skiers and who would teach children to ski. TECHNICAL SKILLS FOR ALPINE SKIING, by Ellen Post Foster. Turning Point Ski Foundation: South Hero, VT, 1995. Skills for all ages, but with emphasis on junior skiers, with many photos of them. 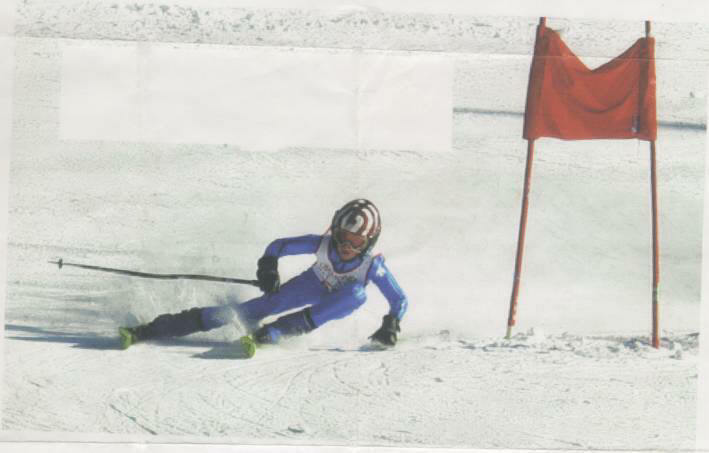 RACE SKILLS FOR ALPINE SKIING, by Ellen Post Foster. 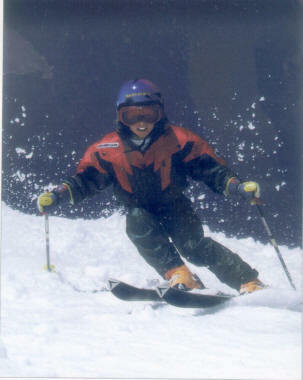 Turning Point Ski Foundation: South Hero, VT, 1994. Skills for all ages, but with emphasis on junior skiers, with many photos of them. a ten-year old skier. It's not all about cute. prior CSW #21: "Old people can't ski well"
CSW #22: "Kids have to use the wedge more than adults do"
next CSW #23: "Skiing makes my thighs hurt (or calves, or etc.)" This "Children and Skiing" page last modified 11/03/2017 07:21:37 AM. Did you come here from a link on another website? For latest version of this page, copy to your browser: http://www.SkiMyBest.com/skichil.htm. Copyright © 2013, 2014, 2015, 2016, 2017, 2018, 2019. William R Jones.